KENMORE – Melissa Barnosky did it again on Sunday. She won an American Legion oratorical contest. Barnosky, a senior at Albion, won the state title last year. She is competing again this school year and won the Albion competition and then at Orleans County. On Sunday she competed at the district competition at Kenmore and came in first place. She advances to the zone competition on Feb. 2 in Mount Morris. If she wins there, she will qualify for the state contest in Albany the first weekend in March. 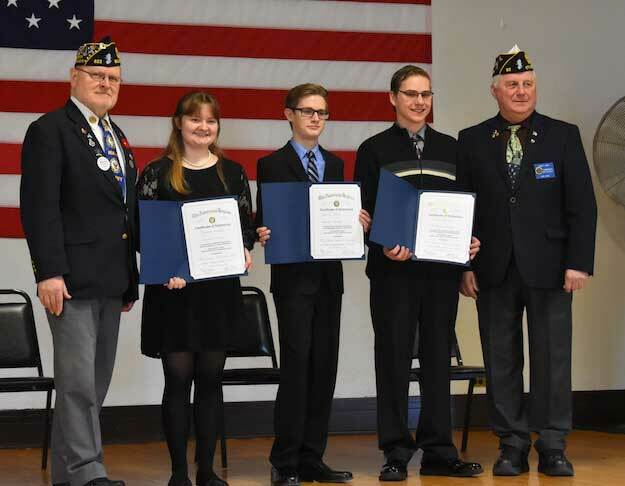 Pictured from left include: Wayne Sorrentino (Oratorical Contest District level vice chairman), Melissa Barnosky, Shawn Calmes, Gavin Swanson, and John Miga, Eighth District Commander for the American Legion.